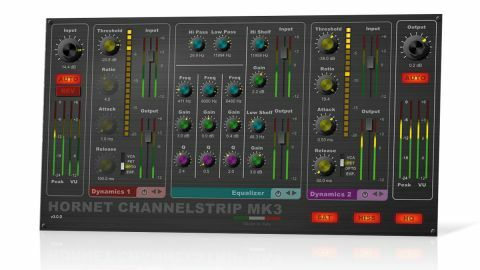 ChannelStrip MK3 sounds lovely, benefits from two dynamics modules, and is well- priced - but there are a few omissions. Excellent analogue saturation. Super-fast FET compressor sounds great. CPU-efficient oversampling mode. Useful auto-gain feature. Two separate dynamics modules. EQ lacking in flexibility. No range control for expander/gate. Italian developer HoRNet offers an extensive catalogue of simple, affordable plugins, one of the oldest being ChannelStrip, recently updated to version 3. ChannelStrip MK3 (AU/VST/RTAS) boasts a shiny new interface, with modules arranged horizontally rather than vertically, as they were in version 2. Beyond the visuals, the core processing elements - namely one Equaliser and two Dynamics modules, topped and tailed by Input and Output sections - remain the same, but for some minor changes. "The saturations are really impressive, adding a welcome upfront edge"
Each of the two Dynamics modules offers a choice of four compression and expansion modes: VCA, FET, Opto and Expander. The ranges of the threshold, ratio, attack and release parameters change to reflect the current option, and for Opto, only threshold is available. Common to all models is a gain reduction meter. The Equalizer module's previously restrictive three parametric bands all now span a full 100Hz-10kHz frequency range and are accompanied by Hi Shelf (1.5-15kHz) and Lo Shelf (30-200Hz) bands, and 18dB/octave Hi Pass (20-200Hz) and 12dB/octave Lo Pass (2-20kHz) filter sections. Both the Dynamics and Equalizer modules include their own input and output trim controls (-40dB to +15dB) and VU metering, while the plugin's main input and output modules have gain controls (-60dB to +30dB range) with peak and VU metering, and phase reverse for the input. New to version 3 are two automatic gain options on the input and output, which adjust the main gains to achieve a target level of -18dB using a five-second analysis window. Finally, ChannelStrip has always enabled modules to be re-ordered, but v3 expands this option to include all six possible combinations. ChannelStrip's analogue emulation has been beefed up for version 3 and is now handled by two components: Sat(uration) and Hiss, with the hiss level reduced slightly from that of version 2 to better suit multichannel use. The Sat option adds various harmonic distortions, depending on which processor you have loaded. Opto is the most coloured (2nd, 3rd and 5th harmonics), FET less so (2nd and 3rd) and VCA the cleanest (3rd only). Meanwhile, the EQ module adds 3rd harmonic distortions. The saturations are really impressive, adding a welcome upfront edge. Also great are the Opto and FET compressors, which, respectively, deliver squashy and super- fast compression. We really like having two Dynamics modules to work with, too. On the downside, there are no range or mix options for the expander, and the EQ, although better than that in version 2, lacks flexibility, with no individual band bypass or slope options for the filter or shelves. Overall, ChannelStrip MK3 is a solid plugin, with useful features and a good sound, and it doesn't put much strain on the host CPU. However, it's lacking some basic options, and although the forthcoming update will refine the interface (including peak hold for the meters) and add AAX support, we'd still like to see the aforementioned omissions addressed.